Free expansion of the ejecta, until they sweep up their own weight in circumstellar or interstellar medium. This can last tens to a few hundred years depending on the density of the surrounding gas. Sweeping up of a shell of shocked circumstellar and interstellar gas. This begins the Sedov-Taylor phase, which can be well modeled by a self-similar analytic solution (see blast wave). Strong X-ray emission traces the strong shock waves and hot shocked gas. Cooling of the shell, to form a thin (< 1 pc), dense (1-100 million atoms per cubic metre) shell surrounding the hot (few million kelvin) interior. This is the pressure-driven snowplow phase. The shell can be clearly seen in optical emission from recombining ionized hydrogen and ionized oxygen atoms. Cooling of the interior. The dense shell continues to expand from its own momentum. This stage is best seen in the radio emission from neutral hydrogen atoms. Merging with the surrounding interstellar medium. When the supernova remnant slows to the speed of the random velocities in the surrounding medium, after roughly 30,000 years, it will merge into the general turbulent flow, contributing its remaining kinetic energy to the turbulence. Composite, in which a shell contains a central pulsar wind nebula, such as G11.2-0.3 or G21.5-0.9. Supernova remnants are considered the major source of galactic cosmic rays. The connection between cosmic rays and supernovas was first suggested by Walter Baade and Fritz Zwicky in 1934. Vitaly Ginzburg and Sergei Syrovatskii in 1964 remarked that if the efficiency of cosmic ray acceleration in supernova remnants is about 10 percent, the cosmic ray losses of the Milky Way are compensated. This hypothesis is supported by a specific mechanism called "shock wave acceleration" based on Enrico Fermi's ideas, which is still under development. Indeed, Enrico Fermi proposed in 1949 a model for the acceleration of cosmic rays through particle collisions with magnetic clouds in the interstellar medium. This process, known as the "Second Order Fermi Mechanism", increases particle energy during head-on collisions, resulting in a steady gain in energy. A later model to produce Fermi Acceleration was generated by a powerful shock front moving through space. Particles that repeatedly cross the front of the shock can gain significant increases in energy. This became known as the "First Order Fermi Mechanism". 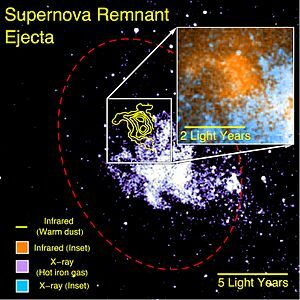 Supernova remnants can provide the energetic shock fronts required to generate ultra-high energy cosmic rays. Observation of the SN 1006 remnant in the X-ray has shown synchrotron emission consistent with it being a source of cosmic rays. However, for energies higher than about 1018 eV a different mechanism is required as supernova remnants cannot provide sufficient energy. It is still unclear whether supernova remnants accelerate cosmic rays up to PeV energies. The future telescope CTA will help to answer this question. ^ Reynolds, Stephen P. (2008). 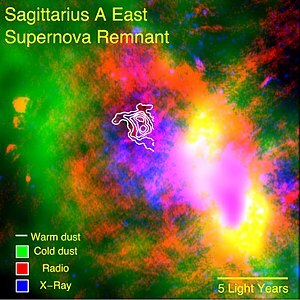 "Supernova Remnants at High Energy". Annual Review of Astronomy and Astrophysics. 46 (46): 89–126. Bibcode:2008ARA&A..46...89R. doi:10.1146/annurev.astro.46.060407.145237. ^ a b K. Koyama; R. Petre; E.V. Gotthelf; U. Hwang; et al. (1995). "Evidence for shock acceleration of high-energy electrons in the supernova remnant SN1006". Nature. 378 (6554): 255–258. Bibcode:1995Natur.378..255K. doi:10.1038/378255a0. ^ "Supernova produces cosmic rays". BBC News. November 4, 2004. Retrieved 2006-11-28. ^ "SNR and Cosmic Ray Acceleration". NASA Goddard Space Flight Center. Archived from the original on 1999-02-21. Retrieved 2007-02-08. ^ E. Fermi (1949). "On the Origin of the Cosmic Radiation". Physical Review. 75 (8): 1169–1174. Bibcode:1949PhRv...75.1169F. doi:10.1103/PhysRev.75.1169. ^ a b "Ultra-High Energy Cosmic Rays". University of Utah. Retrieved 2006-08-10. Wikimedia Commons has media related to Supernova remnants.